Kisapmata, a movie about a deranged retired policeman, got nine of the 13 awards, including best picture, in the 1981 Metro Manila film festival awards ceremonies held at the Cultural Center of the Philippines last night. The movie, earlier banned from being shown until the hearing on a suit involving it starts on Jan. 4, also won for Mike de Leon the best director award, De Leon, together with Clodualdo del Mundo and Raquel Villavicencio, also won the best screenplay award. Vic Silayan, the lead actor in Kisapmata, won the best actor award, Jay Ilagan and Charito Solis were adjudged best supporting actor and actress, respectively. Kisapmata, produced by Bancom Audiovision, also got the best production design, best sound, and best editing awards. 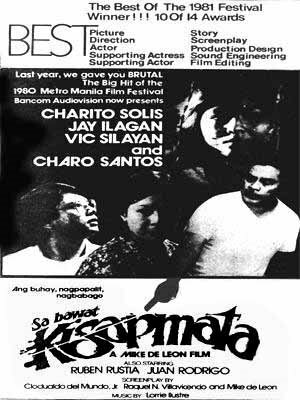 This entry was posted in ARTICLES and tagged 1981 Metro Manila Film Festival, AWARDS, Kisapmata Wins Nine Awards, Vic Silayan, Vilma Santos. Bookmark the permalink.